The Rev. Francis White, CSV, the oldest member of the Viatorian Community, passed away peacefully on Sunday, June 7, 2015 at the Viatorian Province Center in Arlington Heights. Born Sept. 19, 1917 in Springfield, IL, he served as a priest for 71 years and in religious life for 78. Fr. White was 97. Fr. White attended Cathedral Boys’ High School in Springfield, where he first met the Viatorians. Shortly after graduating, Fr. White took his first vows in 1937 as a Viatorian brother. For one year, he attended St. Viator College, studying Latin, before it closed in 1938. His passing marks the end of an era. Among Viatorians, Fr. White was the last living link to St. Viator College. 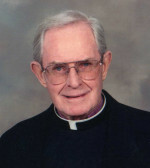 He was ordained a priest in 1944, after earning his bachelor’s degree in Latin from St. Ambrose College. He went on to earn a master’s degree in school administration from the University of Illinois. His ministry took him across the country and around the world, literally. His first assignment came in 1944, when Fr. White taught at St. Joseph School for the Deaf in the Bronx, before he returned to Illinois to teach at St. Philip’s High School in Chicago and Cathedral Boys’ High School in Springfield. When the Viatorians opened a high school in Kyoto, Japan in 1948, they turned to Fr. White to be its principal and superior, a title he held at Rakusei St. Viator High School until 1956. Upon returning from Japan, he served in Illinois, both at Cathedral in Springfield and as principal at Spalding Institute in Peoria. He also served as spiritual director at the Viatorian Novitiate in Arlington Heights, 1961-1963. The latter part of his ministry was spent doing pastoral work, mostly in Las Vegas. 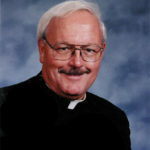 He led St. Viator Catholic Community as pastor from 1970-1979, and later served at Guardian Angel Cathedral in Las Vegas, as associate pastor from 1983-2006, before retiring at the Viatorian Province Center in Arlington Heights. A funeral Mass took place June 12 at the Viatorian Province Center in Arlington Heights, followed by a Memorial Mass on June 16 at St. Viator Catholic Community in Las Vegas. Fr. White was interned in the Viatorian plot at Queen of Heaven Catholic Cemetery in Hillside.